The Nanticoke River Jamboree is sponsored by the Nanticoke Historic Preservation Alliance, a nonprofit organization dedicated to restoring historic “Handsell” House and the preserving the land on which it stands, along Chicone Creek in Dorchester County, Maryland. The centerpiece of the Handsell Historic Site is the “old brick house at Chicone”. A mystery even in local lore, many rumors and stories have surrounded this ancient structure, so that even neighbors on Indiantown Road never truly understood the history of this quirky building. Seemingly a “hodge-podge lodge”, the house is actually an 1837 rebuild from ruins of an earlier, 18th century grand plantation house. Spend time during our annual Nanticoke River Jamboree touring Handsell House, which is open only on special occasions such as the Jamboree until restoration is complete. Costumed-guides will tell you the now-known history and explore the mysteries still associated with this nearly ruined dwelling house. The Chicone Village Longhouse is open year-round for self tours. During special events, a costumed interpreter talks of the Life in the Chicone Village. The interior woodwork retains the original milk paint paint finish from 1837. 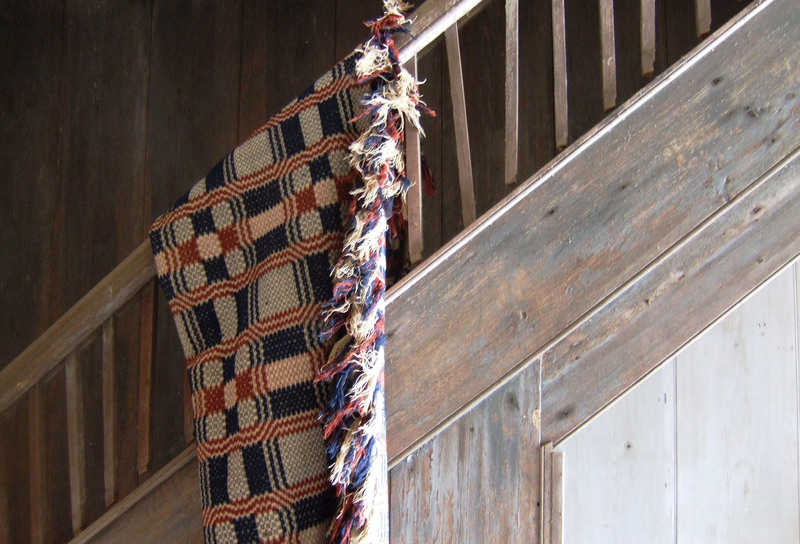 Here, and antique coverlet brings life to this long abandoned stairway. Newly restored window in the Handsell parlor. For a complete history of Handsell go to the website for the Nanticoke Historic Preservation Alliance, Inc Please email restorehandsell@gmail.com or call the event chair at (410) 228-7458 for more information on the Jamboree. I have been on the grounds at an earlier time with my girlfriend. Now I’m ready to go back and be a part of the work sessions to help build a Longhouse (Daniel’s project). I have never met Daniel but can’t wait to do so and become a student of just about anything he wants to teach me. The address of Handsell is 4835 Indiantown Road, Vienna Maryland 21869. Blackwater Nastional Wildlife Refuge is in Dorchester County, but you would have to contact them to see if they allow camping. Thank you for your interest. We hope you can join us at the Jamboree on Oct. 5. All the folks at Handsell will be happy to meet you!